Now that our review is live for everybody to read, we took our time and did a thorough battery benchmarking. The results are in and we are ready to share them with you. Our first test is all about 3G talk time. 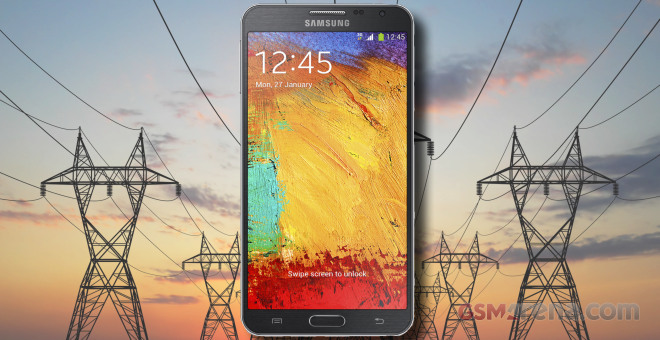 We hooked up the Note 3 Neo to a HSPA-enabled network and left it on the line with another phone. The Neo’s 3,100 mAh battery packed enough juice to last 24 hours and 52 minutes – six hours more than the Snapdragon 800-powered Galaxy Note 3. This is among the best results we’ve encountered so far and a sign that Samsung has developed a very efficient modem for its latest chipset. Then we ran our traditional web browser stress test, where the Galaxy Note 3 Neo came a few minutes short of 10 hours. That’s an excellent result for an AMOLED screen and once again it’s better than what the original Samsung Galaxy Note 3 achieved (by some 50 minutes, no less). Finally, we tested the a looped video playback endurance on the Samsung Galaxy Note 3 Neo. This time around it battery didn’t manage to outlast the original Note 3 model, but the 11 hours and 38 minutes endurance is excellent nevertheless. We thought the lower resolution might help the Neo here, but the Snapdragon 800 once again proved that it’s excellently efficient at decoding video. The six-core chipset and the lower resolution on the Galaxy Note 3 Neo couldn’t help it beat the excellent score of its famous namesake, but the two came virtually on par. 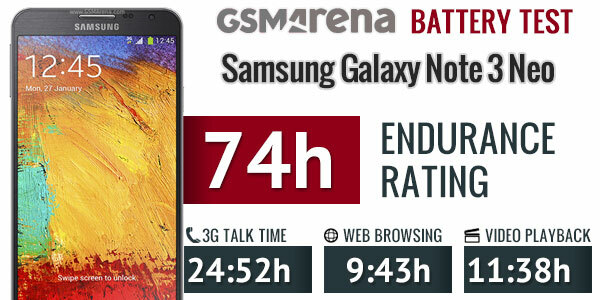 With an endurance rating of 74h, the Note 3 Neo should last for just over three days if you do an hour of calling, an hour of web browsing and an hour of video watching each day. Impressive, indeed!